Today’s postponement of the SpaceX launch of the DSCOVR satellite until Tuesday, February 10 (weather concerns necessitated a scrub of this evening’s attempt), means tomorrow will be twice as shiny for fans of SpaceX and the work they do out in the black! That’s because the crew of Expedition 42 on board the International Space Station closed the hatch on the SpaceX Dragon spacecraft earlier today after packing away all the essential gear, experiments and data that will be sent back to Earth in her belly. Dragon will be detached from the ISS’ Harmony module before being released by Canadarm2 on Tuesday afternoon, and she’ll splash down off the Pacific coast of Baja, California for recovery by SpaceX engineers a few hours before sunset. 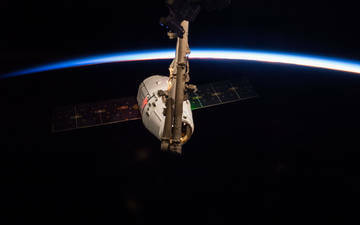 You can watch the NASA TV coverage of the undocking of Dragon beginning at 1:45 pm EST tomorrow. Welcome back, Dragon! Godspeed Falcon 9 and DSCOVR!